The Fédération Française de Basketball (FFBB) are responsible for the "Coupe de France de Basket" competition at senior and youth level. Over the past few years they have experimented with different formats for the women's competition in order to raise the profile of the competition. However last season they reverted back to the classic draw system from the quarter-final onwards instead of the one-draw bracket system that is favoured in the USA. The names of the eight teams that qualified from the eight-final were drawn by Jean-Marc Jehanno, the vice-president of the FFBB. The matches are scheduled to take place on Wednesday, 21 March. But it is possible that the matches may be played on other dates. This year the final of the French Cup will take place on 20 May. 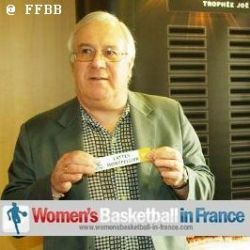 ... au siège de la fédération à Paris, Jean-Marc Jehanno (en images), vice-Président de la FFBB, a procédé au tirage au sort des quarts de finale de la Coupe de France féminine. Les matches se dérouleront le mercredi 21 mars prochain à 20h00. La seule équipe de L2F, Perpignan Basket sera au quart de finale et jouera à domicile contre l’actuel leader de LFB Bourges Basket. Montpellier, gagnant du trophée Joë Jaunay en 2011 se déplacera pour la troisième fois dans la région de Nantes. Cette fois-ci elle rencontrera Nantes-Rezé. Charleville-Mézières et Arras s'opposeront et Cavigal Nice sera face à Challes-les-Eaux.